The United States faced a serious dilemma at the end of 2012 as a combination of steep tax increases and spending cuts were scheduled to occur all at once, known as the "fiscal cliff." A last-minute agreement was reached that diminished the impact of the fiscal cliff. However, because policymakers have been unable to comprehensively deal with our fiscal challenges, a series of "Fiscal Speed Bumps" consistently arise and are often simply kicked down the road as Washington seeks to buy time instead of invest in solutions. A number of these deadlines converged into a "Gathering Storm" that threatened a new fiscal cliff at the end of 2015. A deal was reached in October 2015 that avoided some of these issues and a tax cut and spending package in December dealt with the remaining issues, while adding substantially to the national debt. Under current law, on January 1, 2013, there's going to be a massive fiscal cliff of large spending cuts and tax increases. I hope that Congress will look at that and figure out ways to achieve the same long-run fiscal improvement without having it all happen at one date. The fiscal cliff was minimized and the spending reductions under sequestration were eventually moderated for a couple of years because lawmakers found themselves between a rock and a hard place. While these changes would produce significant deficit reduction, they would do so in an abrupt and careless manner that would impair the fragile economic recovery. On the other hand, an even worse option would be to extend all of the policies with no corresponding offsets, leading to a mountain of debt and all of the associated economic risks. 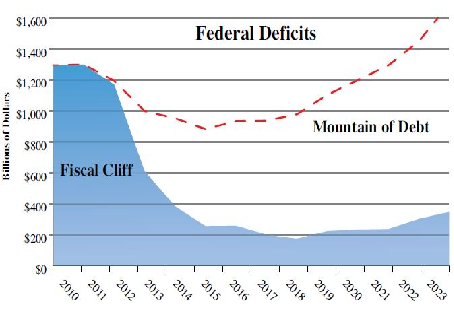 The inability to enact a comprehensive fiscal plan that puts the debt on a clear downward path as a share of the economy in a smart way has resulted in a series of mini cliffs that constantly re-emerge. 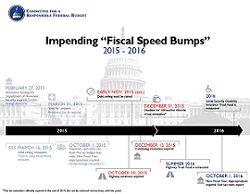 Several of these Fiscal Speed Bumps converged at the end of 2015. The new fiscal year began on October 1 without a new spending plan, but a government shutdown has been avoided by a series of short-term stopgap measures. One complicating factor has been sequestration. The sequester, or sequestration, refers to the annual spending caps that were a part of the fiscal cliff. Many want to replace it with a more sensible approach that deals with all parts of the budget and is less abrupt. The sequester for 2014 and 2015 was replaced by the Bipartisan Budget Act of 2013, also known as Ryan-Murray. Two more years of relief were provided by a deal that became the Bipartisan Budget Act of 2015. Congress has had difficulty authorizing funding for surface transportation projects on a long-term basis. In addition, the Highway Trust Fund (HTF) has faced shortages because revenues through the gasoline tax have not been sufficient. Sustainably financing infrastructure is critical. Highway funding was renewed for five years in December, but the agreement will still leave a signifcant future shortfall in the HTF. 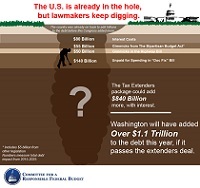 The statutory debt ceiling constantly has to be raised because of rising debt. Reforms to the debt limit should be considered that promote fiscal responsibility without generating much economic risk. The debt limit was suspended until 2017 by the Bipartisan Budget Act of 2015. At the end of last year, over 50 temporary “tax extenders” expired. These include individual and business tax breaks for research and experimentation, wind energy, state and local sales tax, and many others. Most are renewed regularly and can be reinstated retroactively through the end of 2015. This could have been an opportunity for comprehensive, pro-growth tax reform that simplifies the tax code, reduces tax rates and deficits, broadens the tax base, promotes growth, and makes thoughtful choices about how to address each tax extender. Instead, lawmakers made a deal that expanded some and made a few permanent, while growing the debt considerably. Are Tax Extenders Worth the Cost? Who Gets What in the Tax Extenders Deal?